Plastic is cheap and durable and has revolutionized human activity. Modern life is addicted to and dependent on this versatile substance, which is found in everything from computers to medical equipment to food packaging. Unfortunately, an estimated 19 billion pounds (more than 8.5 million metric tons) of plastic waste ends up in our oceans every year. Much of this plastic comes from single-use packaging, such as soda bottles and produce bags, and from other single-use products such as straws and disposable diapers. 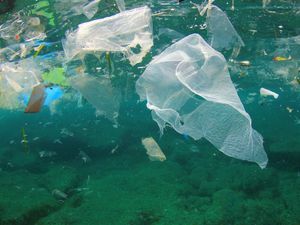 One study suggested that by the year 2050 there will be more plastic by weight in the oceans than fish! Plastic pollution is more than unsightly. It has a deadly and direct effect on wildlife. Many marine organisms get physically entangled in plastic trash and either drown or slowly starve to death. Others eat the plastics, mistaking the ubiquitous materials for food. Leatherback sea turtles often confuse plastic bags for their jellyfish prey and asphyxiate. Seabirds, especially albatrosses, and other birds that scoop food from the sea have been found dead on their nests, their bellies too full of plastics to survive. A recent study found plastic trash in 90 percent of seabirds, with pieces ranging from bottle caps to rice-sized fragments that look like seeds. Perhaps even more worrisome is microplastic pollution. The vast majority of plastics are not biodegradable, meaning they break down into smaller and smaller particles but never leave the environment entirely. Pieces smaller than 5 mm (0.2 inch) are classified as microplastics, and it is estimated that a significant portion of all plastic pollution in the oceans is now in this category. Microplastics also come from cosmetics, body washes, and toothpastes, which use tiny pieces of plastics as exfoliants and abrasives, and from items of synthetic clothing that shed minute fibers each time they are washed. These particles and fibers are too small for waste management systemsto filter and are directly discharged into the oceans. There is concern that these microplastics and/or the endocrine-disrupting chemicals they contain will bioaccumulate (become progressively more concentrated in the bodies of organisms up the food chain), since they are about the same size as plankton that serve as the base of the food chain. Many marine organisms have already been found with microplastics in their bodies. Studies on marine worms and oysters have found that microplastics disrupt their feeding and reproduction, causing a failure to thrive. These tiny fragments could also contaminate humans directly, as microplastics have been found in sea salt sold for human consumption. Disturbingly, global plastic production doubles every 11 years, meaning the amount of plastic pollution will only continue to increase without drastic changes. To help battle this dire problem, be aware of your consumption of single-use plastics—it will likely shock you to realize how seemingly everything comes in plastic. Reduce your consumption of these products and reuse the containers whenever possible. Avoid health and beauty products that use plastic microbeads. Buy reusable bags, straws, and glass or metal beverage containers. Buy pantry basics, like rice and beans, in bulk, and avoid putting your produce in plastic bags for the short trip home. Recycle the plastic you do use, but be aware that not every plastic can be recycled. Participate in beach, river, or lake cleanups and help raise awareness of the problem. Encourage your employer and the companies and restaurants you patronize to facilitate greener options, such as paper products over plastic disposables. Support legislation that targets plastic pollution and the fossil fuels from which they are made. The challenge is huge, but, like plastics themselves, small actions accumulate. This entry was posted in Animals/Insects, Health, Science, World and tagged Oceans, Plastic, Pollution by rolyred. Bookmark the permalink.